Anyone with an account on Zanata can create a translation project for their documents. You will need to Create a project and Create a version to upload strings. Go to Documents tab, click on down arrow on top of Document panel. Select Upload new source document. Browse or Drag your documents into the dialog and click Upload Documents. You can access the same dialog in by go to Settings tab -> Documents section. Click + sign on top left panel. 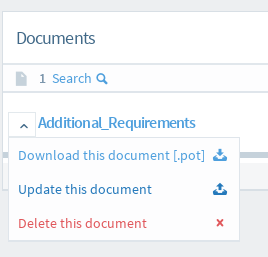 Go to Documents tab, click on down arrow on left side of document and select Update this document. Select your file and choose the source language for this file. Go to Settings tab -> Documents section. Click + sign on top left panel. Click on Update this document icon on right side of a document. 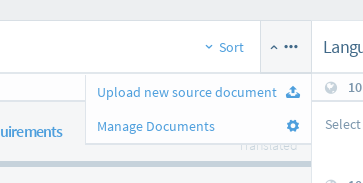 Click on Languages tab in version page, select the language of translation document you wish to upload. On right panel, click on the down arrow(Translation option) on left side of document and select Upload translation. On the dialog, select your translation file. Merge option - If unchecked, uploaded translations overrides current translation, otherwise, it will merge with current translation in system. My translations option - Indicates if all uploaded translations were translated by you. Other document formats uploaded as translation sources will have no, or potentially undesirable, results. See Zanata-Client push command for more information.